Social login options have become a necessity today. Every internet user has a number of user accounts on several sites and your store might be one of them. It is so tough to remember the credentials of all of them. 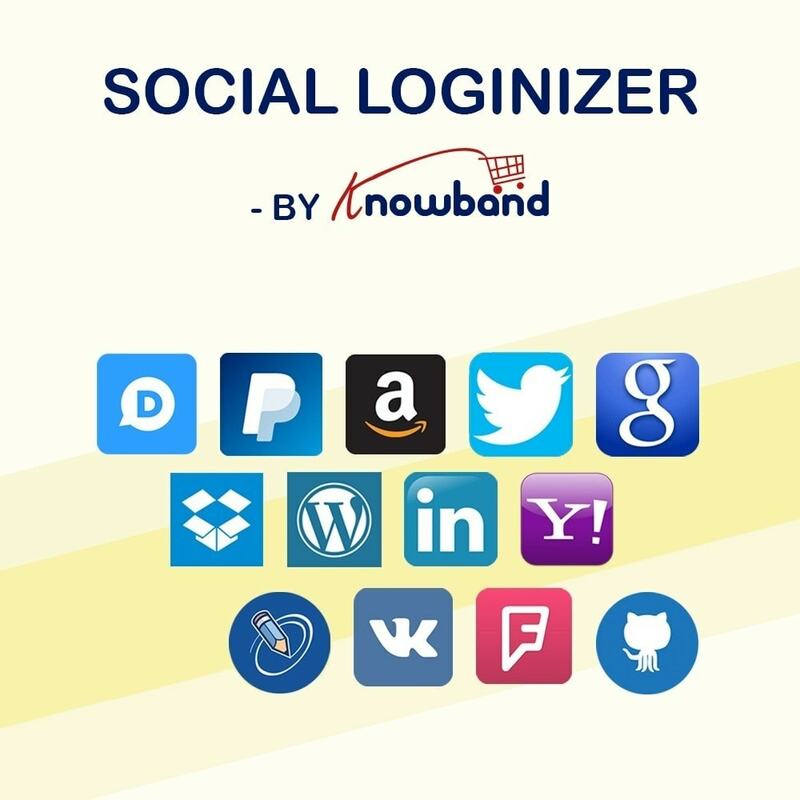 This is where the Social Loginizer module comes as a savior for your store by allowing users to log into your store using their social media account. That is, users need to just log into their Facebook account and they will be automatically logged into your store via Facebook API used in our Prestashop social media login module. There are total 14 options like Facebook in our module. 1. 14 social login options with small and large buttons. The Prestashop facebook login extension sends customer email id to your Mailchimp list as soon as they register using our module. It also helps you build your MailChimp email list. The Prestashop twitter login extension assigns different MailChimp list to each login option. This Prestashop plugin check customers list who are registered with Facebook, Google etc using the detailed reports. Check how many times a customer has logged in to your store using Facebook, Google etc. Check which social login option is more popular in your store. The Prestashop google+ login extension has the option to add custom CSS to customize the look and feel of the module's front. The Prestashop social login has the option to show pop-up type login or use a redirection. Drag and Drop to change buttons order and position on the front. Option to place social login buttons anywhere on the website. Very detailed steps to configure everything in admin panel itself. The social login Prestashop module improves the shopping experience with a logged in checkout. This Prestashop plugin improves the sign-up rates in your store. The social login plugin allows customers to log in using their social media account. The Prestashop social media login captures customers' email addresses and syncs with MailChimp email list. Can also generate a random password for social sign-ups and send it to customer's email address. Easy options to add Social login buttons on any website page. Option to change button order arrangements of the social login buttons. With the help of this Prestashop google+ login extension, the admin can input custom CSS codes to customize look and feel. The Prestashop module has the option to choose from Small or Large social buttons. Option to configure the APIs of all the social login options separately. The admin can enable/Disable a particular login option anytime you wish to. The Prestashop social media loginizer allows the admin to view the detailed report to compare the statistics of regular login vs social login. The Prestashop facebook login extension is compatible with all the PrestaShop themes. Compatible with both SEO URLs and SSL enabled websites. The Prestashop google+ login extension compatible with the Multi-language store. This social login Prestashop module is compatible with our "One-page checkout module". It can show all the buttons on our checkout page. This module encourages customers to share your products on their Facebook profile and win random discount coupons. Admin has the access to manage how much discount would be given. Saves your customers from the burden to remember yet another set of credentials. Saves the customers from filling out lenghty account registration forms. They can login using any device as the module is fully responsive. They also get a random generated password on their email address to login. 1. Homepage header: Customer will get to know what options you provide for registration. 2. Login page: Login page must have all available login options. 3. Checkout page: To allow guest customer to create an account with just one click. Their Cusomercare is wonderful! Joe was so patiente! I suggest to all!